DR. JOHNSON: Sir, it is a very vile country. MR. S: Well, sir, God made it. DR. JOHNSON: Certainly He did, but we must remember that He made it for Scotchmen. Comparisons are odious, Mr. S, but God made Hell. Oats: a grain which in England is generally given to a horse, but in Scotland it supports the people. Much may be made of a Scotsman, if he is caught young. The noblest prospect which a Scotman ever sees, is the high road that leads him to England. What enemy would invade Scotland, where there is nothing to be got? Wow! Compare this sentiment to that of the Victorians, who embraced Scotland and made it “cool” after Queen Victoria visited in 1842, she herself entranced by Sir Walter Scot’s novels about Scotland and its illustrious history and fascinating personages. 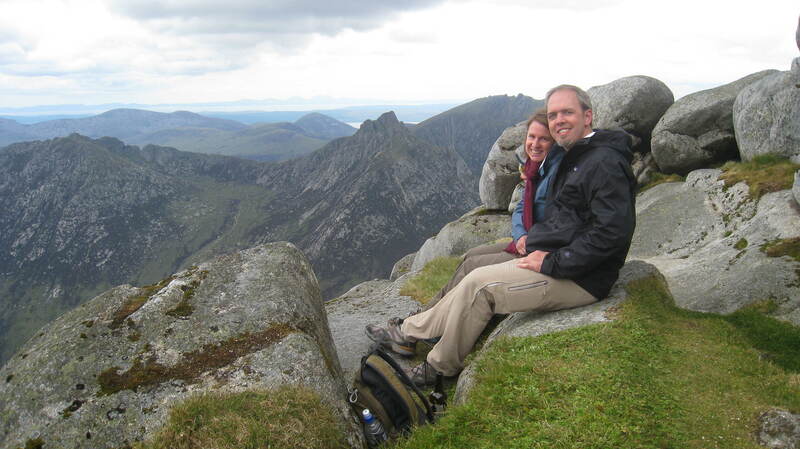 While it does not compare to Everest, McKinley, Whitney or even the Half Dome in Yosemite in height, Goat Fell at 2,866 feet on The Isle of Arran is the highest mountain we have ever climbed. Now there is no universally accepted criterion for or definition of a mountain – some countries mark it from 1,000 feet, others closer to 2,000 feet – but the fact that my legs required three days to heal before I ceased to wince with every step give all indication of a proper mountain. It took around 2 hours 15 minutes for the ascent, and around 90 minutes for the descent. We started the climb from Brodick Castle, seat of the Dukes of Hamilton, in Cladach, a longer but less steep way to get up to the top, and what began as lush terrain full of trees and water rivulets, gradually morphed into brush and rocks and sand, then just large rocks, nestled comfortably in the loamy soil cloaking the precipice. The last several hundred feet of the climb forced us to scramble, using our hands and arms as much as our feet and legs for balance and propulsion, and alternate taking off and putting back on our fleeces and windbreakers as it was neither consistently warm nor cold. As with most things that require considerable effort to complete, the result was entirely worth it. 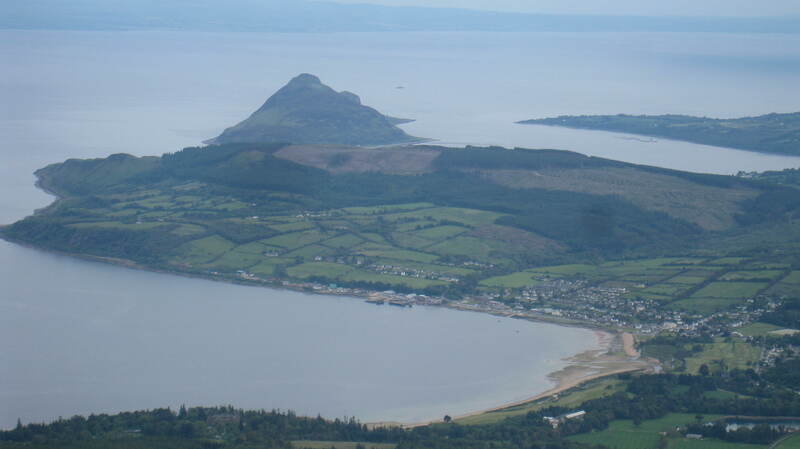 Hoping for and getting a clear view from the top, we were able to see the village of Brodick, the Holy Isle off the village of Lamlash, the Kintyre Peninsula from where we set off via ferry to Arran, and the Isles of Islay and Jura. Most impressive was that the clear day allowed us to see the coast of Ireland, which was much closer that I had expected. We were certainly not alone on Goat Fell, as most of the people who visit the isle come to play golf, or climb Goat Fell. 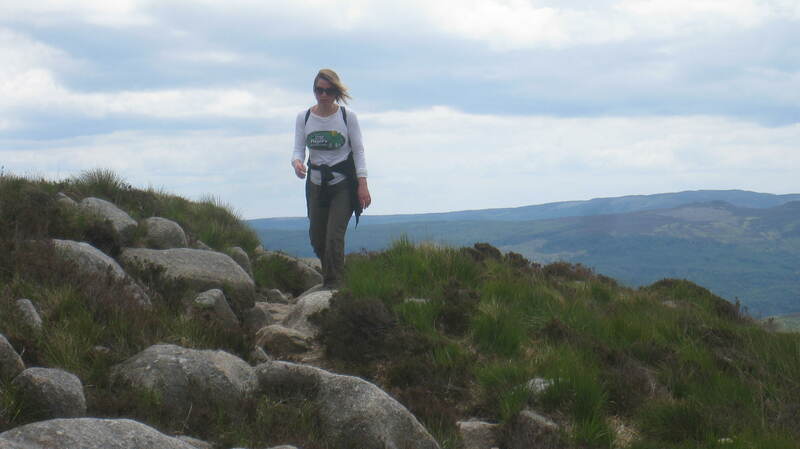 The “locals” have all climbed Goat Fell at least once in their lives. I use the term “local” loosely because most inhabitants of Arran are recent Glaswegian transplants or English who grew tired of the weather in Newcastle, Manchester and Birmingham and decided to move somewhere decidedly warmer. And slower. Two curries for the price of one! When we told people that we would start The Grand Tour in the UK, we were duly informed by more than a few that we would be eating mostly curry because the food in England and Scotland is “crap.” As this is my seventh visit to this part of the world, and three months into this run, I can safely say that the food is not mostly “crap.” We have had some extraordinary gustatory experiences here, several ethereal, one abominable, and, yes, during some of those exquisite moments we ate curry. But to be introduced to one of the best Indian restaurant experiences of our life by a bag of crisps was something I hadn’t ever considered. Our new Scottish friends, Brian and Mary, are curry aficionados and invited us to join them at their favorite Indian restaurant in Edinburgh, The Spice Pavilion. 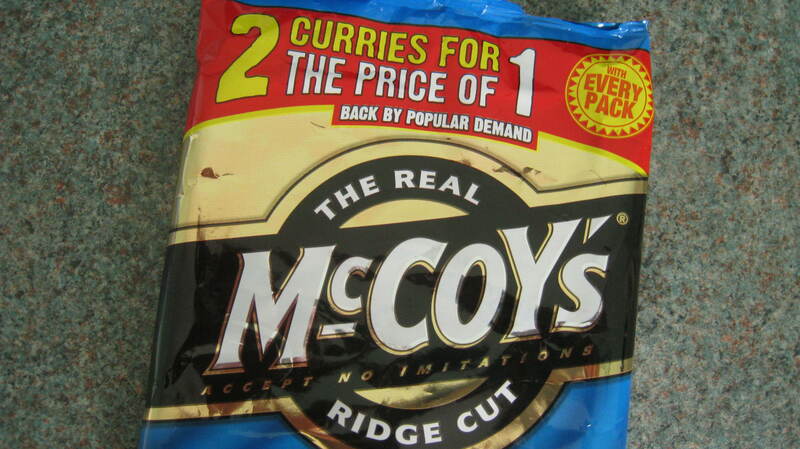 The innocuous name doesn’t do much for its reputation for culinary delight (it may as well be called Taj Mahal, Maharaja, or something with the word “Indian,” “hut” or “palace” in its name, like most of these places), neither did its participation in “McCoy’s Crisps 2 Curries for the Price of 1” offer, brought “back by popular demand.” Any restaurant participating in this scheme is only interested in getting in the masses and not producing quality dishes using quality ingredients, surely. 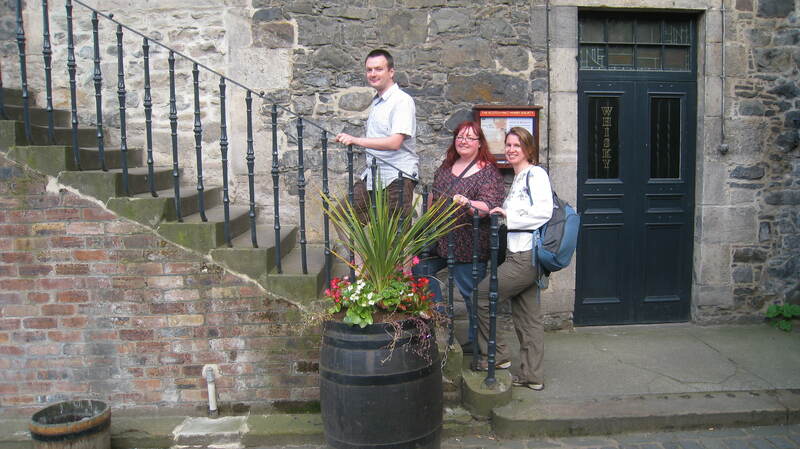 After meeting Brian and Mary at one of their locals, The Stockbridge Tap, in the trendy area of the city called Stockbridge, for a quick drink before dinner, we set off for the restaurant, a short walk away from the pub. About half a block from the pub Brian separated from us and made a quick dash into the local Sainsburys to buy a bag of crisps (god is he that hungry? He can’t wait 10 minutes? Geez.) I saw him dutifully inspecting each bag, passing over various flavors, from Flamed Grilled Steak, to Peppered Rib Eye Steak, Jalapeño Chilli with Cheese, Cheddar with Mango Chutney, Oriental Ribs and Thai Sweet Chicken, stopping at the rather pedestrian sounding Cheddar and Onion (bo-ring.) During his search Mary explained to me the restaurant offers 2 for 1 meals in partnership with McCoy’s Crisps and Brian was simply looking for the bag displaying the promotion. (Oh. These Scots are thrifty!) Correct bag in hand, and with a snack to tied us over before dinner (I was feeling a bit peckish at this point), we marched to Spice Pavilion with the golden ticket. The restaurant itself is down from street level, and is decorated in white, cream and burgundy. 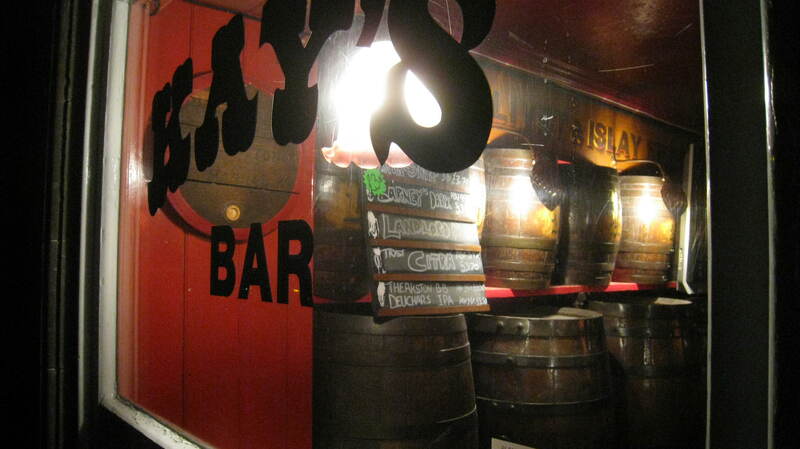 The servers all wear vests of red tartan and are smiling, attentive and polite. We followed Mary and Brian’s lead and ordered haggis samosas (you read that correctly) and spicy tandoori lamb chops to start. The haggis samosa was scrumptious, with just a hint of spice. And the lamb chops were phenomenal! At turns spicy and tangy, delicious with a bit of lime and cilantro on top. 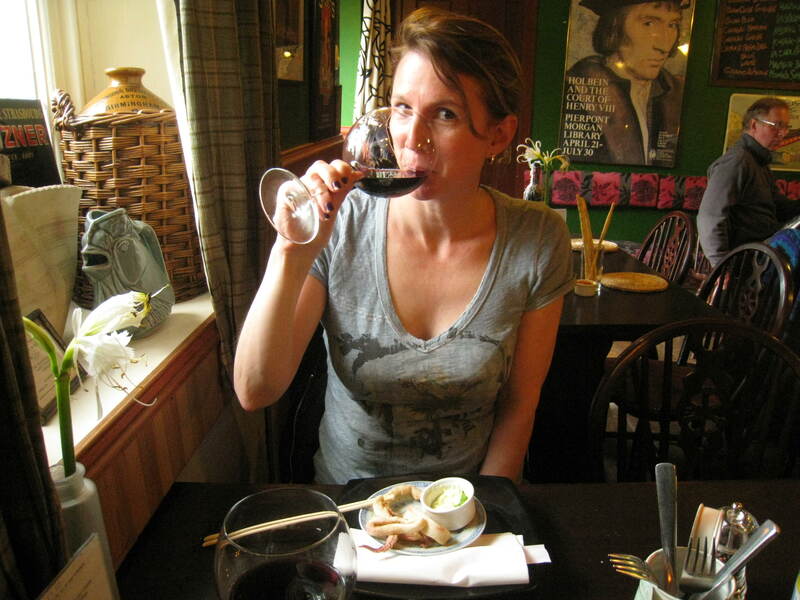 I could eat a heaped plateful of these things – they were so good. For mains I had the Achari Murgh, a chicken dish cooked with mango pickle, and fed my love of all things sour, and Steve had the Murg Pudina Wala, another chicken dish with poppy seed, chili and coconut milk – rich and hearty. Both were outstanding and the flavors good foils for each other (we were kind to one other and shared.) On the side we had the Tarka Dal, a very garlicky lentil dish which complimented the mains. The owner, whom Brian and Mary know quite well, concluded our spectacular meal with Gajar Ka Halwa, a dessert made from cottage cheese dumplings poached in condensed milk garnished with pistachios, and served it to us on the house. Pleasantly full, we waddled over to the Kay’s Bar, formerly a wine merchant for over 150 years and today a quaint pub serving an impressive array of real ale and malts, for a nightcap. A wonderful way to end a great evening of new food experiences with new friends. From the sublime to the ridiculous. Or the inedible. When we eat something frightfully awful, we tend to use cliched hyperbole to describe it: “I wouldn’t feed that to my dog!” “I wouldn’t eat that even if it were the last thing on earth!” “I wouldn’t wish that on my enemy!” “This makes (insert awful food here) taste good!” Etc. At the risk of delving into histrionics these exclamations apply to the breakfast we had at the Highlander B&B in Inverness. To this day Steve can’t even talk about it. We were warned. We had done our research. Fellow travelers via Travelocity, Yelp! and TripAdvisor thoughtfully implored us to “Stay Away!”, “Don’t waste your money!” and “Avoid like the plague!” insisting that the “Manager is incredibly rude,” “They don’t care and just want your money” and “I got bed bugs from this place.” And, most prophetic, “The breakfast is disgusting – WORST OF MY LIFE.” But The Highlander was the only place with availability that we could find and since we would be there for only one night, a stopping point before heading to The Black Isle, we could tough it out. The Highlander is on a street which I call “B&B row” for that is all I saw, B&Bs one after the other, some elegant, others plain, but all detached row houses on a quiet winding road. From the outside, it didn’t look like much. We checked in too early and our room wasn’t ready, but the owner, an Eastern European woman, let us store our bags there, a nice gesture, while we roamed pretty Inverness. At this point I thought well, that wasn’t rude at all. Before we left, she asked if we wanted a cooked breakfast in the morning. Without really thinking, I said “yes.” The cooked breakfasts at the other B&Bs that we had stayed in have been solid, so I wasn’t particularly concerned that the Highlander’s version would be much different, despite warnings to the contrary. Plus there would be toast, fruit, coffee and juice etc., enough to fuel us if we didn’t like the cooked breakfast. Perfect. We walked around the city, had a few drinks, checked back in to the B&B, and settled into our room, a comfortable airy double at the back of the house and with a view of the garden. (This isn’t so bad.) We checked the mattress for bed bugs (none), turned in early, and looked forward to an early start over a hearty breakfast. We had asked for breakfast at 9:00 AM. At the stroke of nine I heard a knock at the door. I slowly unlocked and opened it, only to be met by the owner standing in the hallway who informed me in a disturbingly cheerful manner, “Your breakfast is ready.” (Oh, ok be right there!) I had just finished my ablutions and Steve had just gotten out of the shower. He quickly dried and dressed, and then joined me at the breakfast table. What greeted us on plates at that table can only be described as congealed blocks of meat, egg and bread substances. Not actual sausage and bacon, but lard, grease and chemicals formed into the shape of bacon and sausage, an egg that looked like an egg but tasted like cardboard and dust, and a piece of what looked like triangle-cut bread, toasted and soaked in butter, but tasting neither like bread nor butter. Utterly inedible. The orange juice, the staple liquid of the breakfast table, was a barely juice, tasting of mint cough syrup and I swore I detected a bluish hue to it. I saw a bowl of grapefruit slices which clearly came from a tin (I noticed the opened Morrison’s tin on the continental breakfast table) and remembered that I had seen the same bowl and same tin placed in the same position when we had checked in yesterday. The only redeeming part of the meal was the coffee, which was inoffensive in its wateriness. Such a sad beginning to a promising day. But we had been warned. Lesson learned: listen to those who came before you. 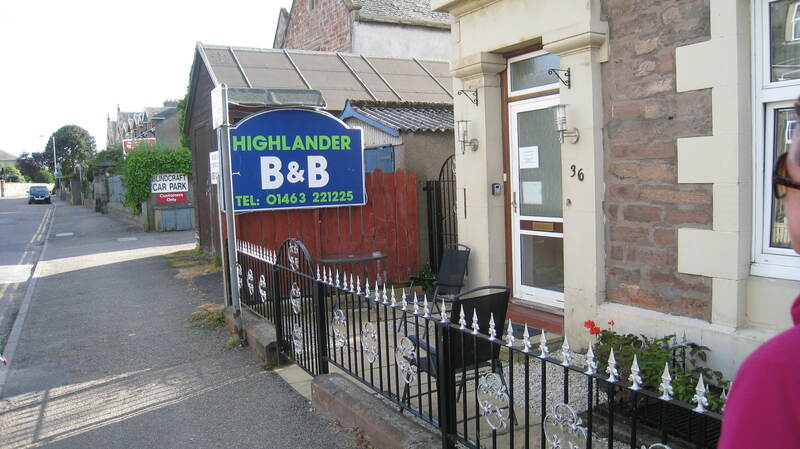 And avoid The Highlander B&B in Inverness like the plague! From the ridiculous, back to the sublime. One of Steve’s London friends told him about a place in Scotland just north of Inverness called The Black Isle, a magical sounding land full of wonder and adventure and just possibly a dangerous encounter or two. 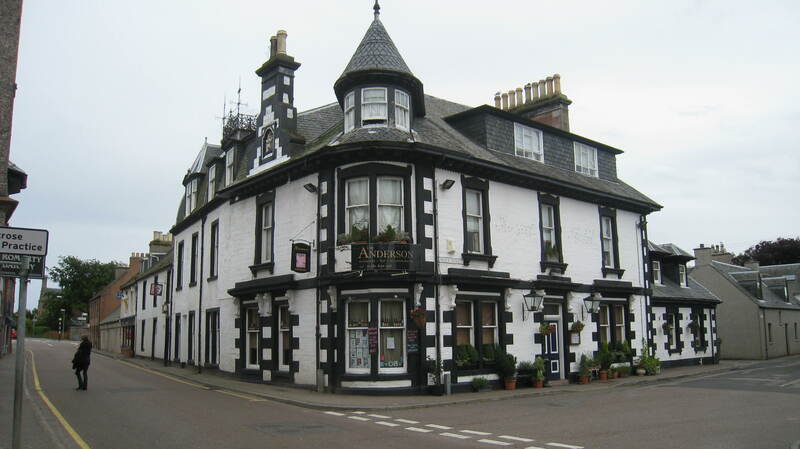 Our purpose for visiting was The Anderson, a restaurant and B&B noted for its Belgian beer and whisky offerings as well as its dishes made from locally sourced ingredients, located in the village of Fortrose. The Anderson is run by Jim Anderson, a transplant from Philadelphia who was heavily involved in the beer scene there but decided to move his family to Fortrose to take over the once-ramshackle hotel that served the long-gone train station and transform it into a foodie destination. The three days there we spent eating and drinking, tasting many varieties of Belgian beer – Cantillon Gueze, Cantillon Rose, Leffe Radieuse, Cuvee des Trolls, Viven Bruin, Viven IPA, and Cookie Beer, which tasted like gingerbread and was perfect for dessert – some local esoteric brews, and tasty whisky, most I had never heard of, including Jura 18, Edradour 14, Glenrdronach 15 and Clynelish. The culinary tour de force was the chef’s (and Jim’s wife) curried cauliflower soup which had the right balance of everything – spice, cream, pepper, veggies – and paired extremely well with the Cuvee des Trolls and Viven IPA. It was so good that I had a bowl with dinner each night. We ended each evening at the Whisky Bar in the hotel tended to by Andrew, an affable and enthusiastic young barman who bore a resemblance to actor Rupert Grint of “Harry Potter” fame, from neighboring Rosemarkie. 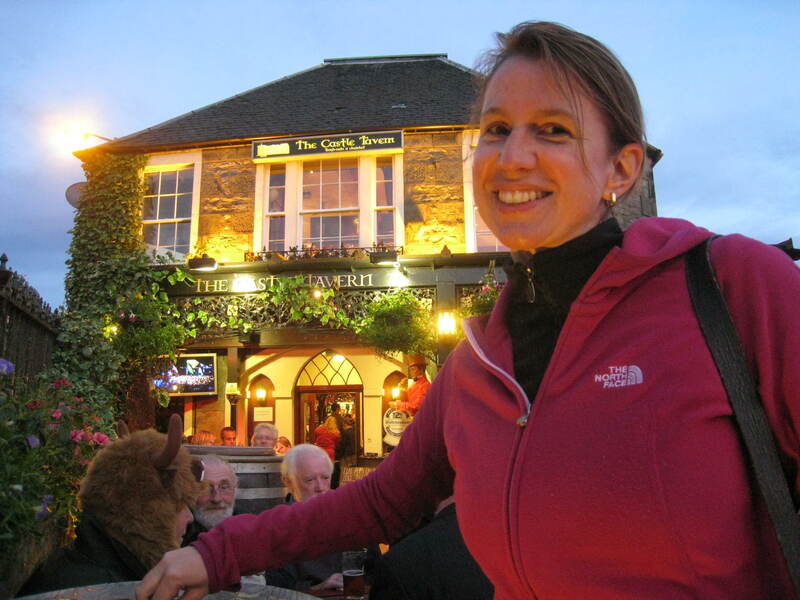 The Anderson’s license allows it to stay open as long as they have customers, and we made sure that we were the last customers each night, staying up long enough to drink with the staff and meet Jim’s friendly dog, Sheba. 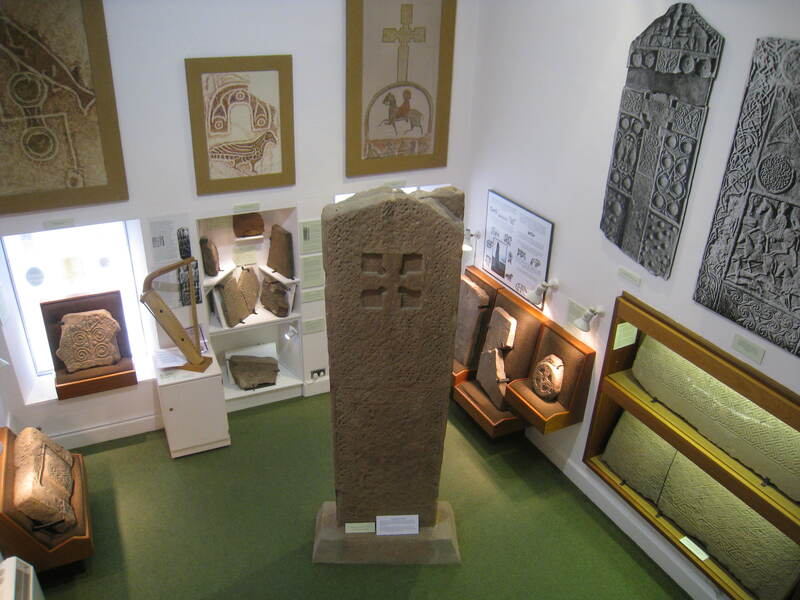 Apart from the food and drink, The Anderson is great base from which to do some hiking, watch the dolphins at Chanonry Point (we didn’t see any, unfortunately) and explore the wonderous Pictish stones and cross-slab at the Groam Museum in Rosemarkie. Older than the Celtic cross we saw at Kildalton on Islay, the Rosemarkie cross-slab dates back to the 8th century and indicates that this part of Great Britain was an very important center of early Christianity. And to think this beautiful cross was found lying in a field! We have met many creatures great and small on The Grand Tour, mostly of the canine variety. 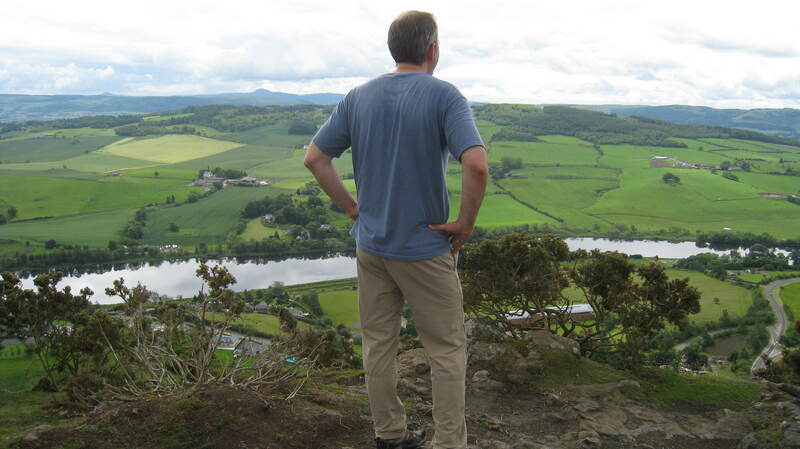 On a walk up Kinnoull Hill in the city of Perth, birthplace of Famous Grouse and Ewen McGregor, we did see dogs, several with either a ball or stick in their mouth, happily trotting up and down small mounds, canvassing clumps of trees or chasing birds. One bird that they dared not chase was a majestic Peregrine Falcon which was perched atop the ruins of an old tower, positioned as though it were a sentinel charged with guarding a nearby vulnerable flock. We had no idea what type of bird this was at the time – the body of an owl with brown flecked wings, the head of what looked like a falcon (I was reminded of the falcon on the opening credits of the TV show “Falcon Crest”, minus the dangling earring things) with cavernous eyes – and it did allow us get close to it, enough for us to take some great shots as though it were posing just for us. It was only when we went to the Perth Museum’s Natural History wing (no pun intended) later that day that we discovered what bird it was. 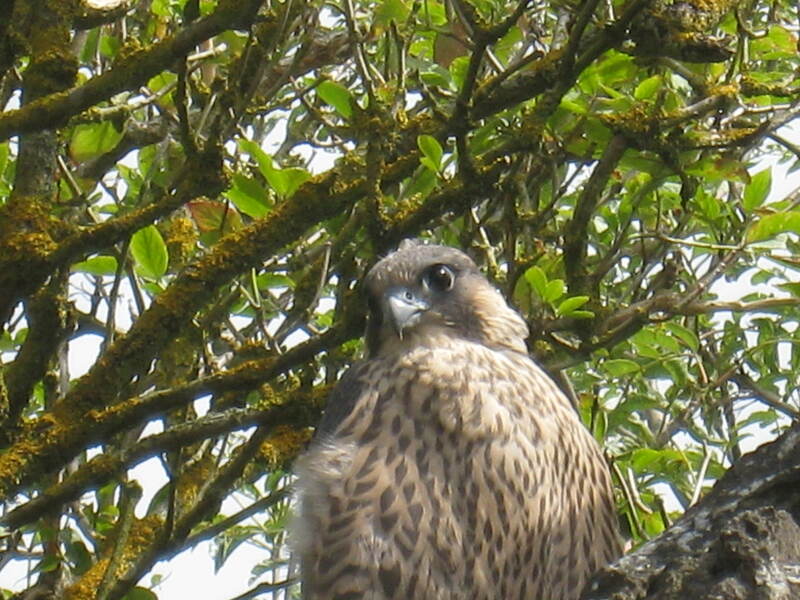 Perched on a trunkless branch jutting out from the wall and encased in glass was a taxidermist-created Peregrine Falcon looking out toward an imaginary horizon. It looked identical to our bird on Kinnoull Hill. We were excited to identify it, especially after learning that the Peregrine Falcon’s numbers have dwindled and sightings are rare. And we saw one! An endangered creature persevering in spite of pollution, loss of habitat, lack of food, hunting, disease. And a talisman for us as we continue The Grand Tour. I love how you guys take pictures of the small, unique details. Congrats on completing your very challenging hike! And here’s hoping you don’t run into any more bad breakfasts in the future. 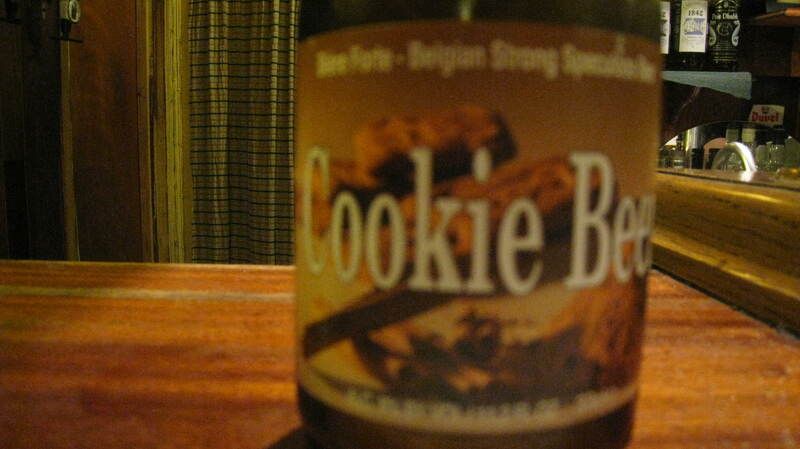 But may there be plentiful amounts of Cookie Beer. Thank you for writing another wonderful blog entry and for posting wonderful pictures. 🙂 Miss you guys a lot!